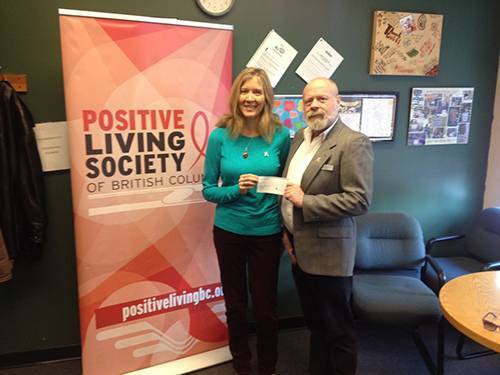 Chair of Theatre Cares, Diane Brown, presents Positive Living B.C.’s President Wayne Campbell with an $8500 donation on World Aids Day, December 1st, 2014. Three other charities received the same amount from Theatre Cares : Aids Vancouver, The Actors Fund of Canada, and The Stephen Lewis Foundation. Theatre Cares Vancouver has raised $35,000 in support of AIDS Vancouver, Positive Living in BC, the Actors’ Fund of Canada and the Stephen Lewis Foundation. Each of these charities will receive $8,500 support from Theatre Cares. This is thanks to The Arts Club Theatre, Bard on the Beach, and Studio 58, whose patrons gave generously. Finding money to keep much-needed programs going is not the only obstacle in the fight against HIV/AIDS. Education appears to be sorely lacking as well. In 2004, the Canadian AIDS Society reported that a large number of youth believe there is not only a cure for HIV/AIDS, but there is also a vaccine available to prevent HIV infection. There isn’t. Theatre Cares Vancouver has been raising funds and awareness since 1991. Throughout each year, Theatre Cares raises money at different events, notably Theatre Cares Week, which takes place in February of every year. Theatre Cares Vancouver is a volunteer-based organization that unites the generous spirit of Vancouver’s performing arts community with its supporters to raise funds and awareness for HIV/AIDS relief and other worthy causes. The funds raised by Theatre Cares Vancouver each year are donated to registered charities that support HIV/AIDS patients both at home and abroad: AIDS Vancouver, the Positive Living Society of BC, the Actors’ Fund of Canada, and the Stephen Lewis Foundation. Revenue comes from t-shirt and other merchandise sales, the Theatre Cares Martini Bar which makes an appearance at various events in the theatre community throughout the season, and from the funds donated at theatres each night by generous audience members during Theatre Cares Week. For news on this year’s Theatre Cares Week, click here. Because our committee works on a volunteer basis, we are able to donate 90% of the funds we raise to the charities we support. These statistics reflect only what is known about the people who have chosen to be tested. The Canadian AIDS Society has reported that a large number of youth believe there is not only a cure for HIV/AIDS, but also a vaccine available to prevent HIV infection. There isn’t.